Well, we’re coming up on Thanksgiving and I want to express my thanks for many aspects of the arts. One thing I’m totally thankful for is the rich history of American art. I may not always love the obsession with realism, but I appreciate it in early American art because the artists were looking to European models that were popular at the time. AND, in a country where, at the time, only portraiture was truly appreciated in painting, Raphaelle Peale helped make still life a mainstream, accepted subject matter in painting. In doing so, he made a way for people of restricted means to show their good taste without spending a fortune on a portrait. Raphaelle was the oldest son of Charles Willson Peale (1741–1827). He learned how to paint from his father while working in his father’s taxidermy studio. He was established as a professional miniature artist by the time he was twenty-five. During the first half of the first decade of the nineteenth century, Raphaelle and his brother Rembrandt Peale (1778–1860) traveled to major cities all over the east coast painting portraits: Rembrandt full sized paintings and Raphaelle miniatures. When his health declined in 1815, Raphaelle no longer felt capable of extensive travel hunting down portraiture commissions. He decided to devote himself to still life painting, even though his father disapproved and still life paintings were not nearly as lucrative as portraits. Although he briefly returned to portraiture in 1820, he had left behind as many as 70 still life paintings when he died prematurely in 1825. 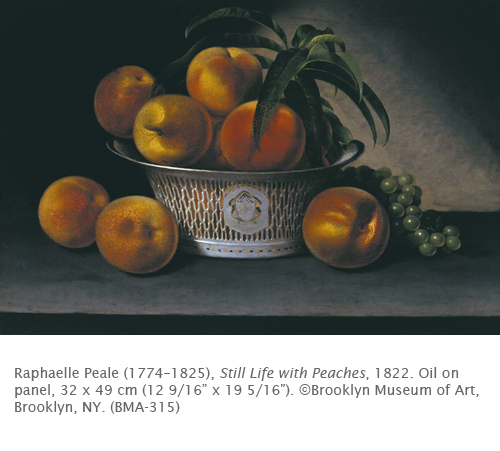 Raphaelle emphasized still life subjects almost entirely the last ten years of his life. He can actually be considered the first professional American still life painter. Raphaelle’s still life paintings are simple and austere. His compositions contained a smaller number of objects, often one type. This is perhaps the influence of Spanish Baroque still life paintings he saw while in Mexico, particularly the work of Juan Sanchez Cotan. In Still Life with Peaches Raphaelle places the still life on a shallow shelf parallel to the picture plane in a shallow space. 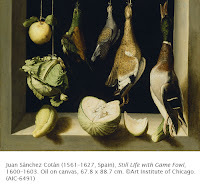 Although the lighting is diffused, as in all his still life paintings, it originates from the left side of the painting. The diffused nature of the lighting creates luminous, soft-edged forms. Although paying close attention to physical detail, Rapahelle’s works do not emphasize flaws in the fruit. Activity: Using color construction paper, use a light color of chalk to create a still life emphasizing the lights and darks of the composition. Work from lightest to darkest values. Create values by rubbing away excess chalk, making sure that the forms go through of the nuaces from dark to light-struck.